From a tale told to me in Solomon Islands. I do not know the area of Solomon islands from which this story originates. I am pretty sure it is NOT Roviana. It was told to me by the skipper of the launch Teriari as we were moored one night during a tour around Choiseul Island. I think he was from Guadalcanal. But who knows where he heard the story? There was a man from a small village who went fishing every day for his family. Each morning he would ask the spirits to give him a good catch that day. He was the most successful fisherman in the village, and every day he caught many fish. He caught many more than he needed to feed his own family. 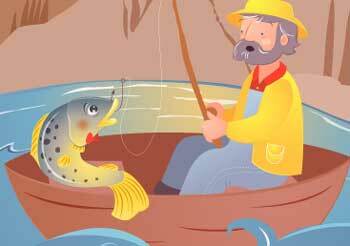 Day after day he would go fishing and every day he would return with a canoe full of fish. But as he paddled home every evening, the fisherman would stop in the mangroves near the village and hide part of his catch. Then he would give the rest of the fish he had caught to his own family, but there was always little left to share with the families of the less successful fishermen of the village. Later, in the dark of night, after everyone was asleep, he would go down to the mangroves and take the extra fish he had hidden, and he cooked and ate them all by himself. Every day was the same, and though the fisherman caught many more fish than any of the others, he did not share with anyone but his own household. Every night he greedily ate the extra fish he had hidden.Then one day on his way home huge waves caught his canoe, and capsized it. The fisherman was afraid he would drown, but suddenly, out of the sea came a huge shark which told the fisherman to hold on to him and he would take him safely to land. The fisherman held on to the sharks dorsal fin and the shark safely delivered him to the beach near the village. The man thanked the shark, whom he realised was a spirit. The shark then told the fisherman off for his selfishness, and warned him that if he did not share his catch with those who needed it, in future he would not even catch enough fish to feed himself and his own family. The man told the shark that he was very sorry, and he would be more generous from then on. As they talked, the waves brought the mans canoe into the bay, and it washed up to the beach beside him. And so the man thanked the shark once more, calling him Uncle, and promised he would always share his catch in future, and never be selfish again. And so he did. I don’t think this tale is from Roviana, but I like the story, because it has a clear moral.The word for shark in Roviana is Kiso. Kiso happens to be the totem of my family, of the Saikile clan. I met Kiso once, in interesting circumstances. But that is for another time.